Even through the state of Louisiana reports one of the lowest unemployment rates in the nation dropping to 4.5 percent, not all areas of Louisiana have witnessed reduced unemployment in the last 12 months. For example, Shreveport suffers from a reversal of the Haynesville Shale boom with a employment decline of 0.2 percent, and Alexandria experienced the largest employment decline at 0.6 percent. 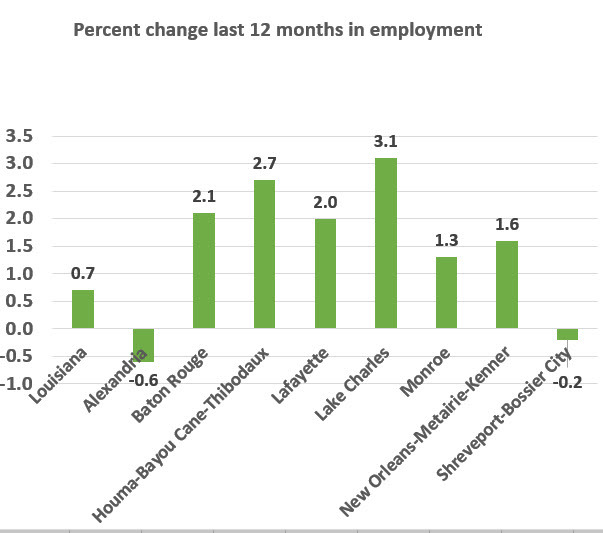 On the flip side, the biggest improvement in employment the last 12 months has been in Lake Charles, up 3.1 percent, followed by Houma, up 2.7 percent, Baton Rouge, 2.1 percent, and Lafayette at 2.0 percent.